A Concise Introduction to Additives for Thermoplastic Polymers focuses on additives for thermoplastic polymers and describes 21 of the most important and commonly used additives from Plasticizers and Fillers to Optical Brighteners and Anti-Microbial additives. It also includes chapters on safety and hazards, and prediction of service time models. While there are many exhaustive and complex books dealing with additives for polymers, the size of them deter students and many industry engineers from using them. The purpose of this book, therefore, is to fill this void and present a concise introduction to this important subject. Written in an accessible and practical style, the author introduces the reader to the complex subject of plastics additives in an engaging manner. His ability to be concise is the result of his teaching courses on the subject and using his own lecture notes for material. This book comprises the author's course notes so that a larger public can benefit from his knowledge. 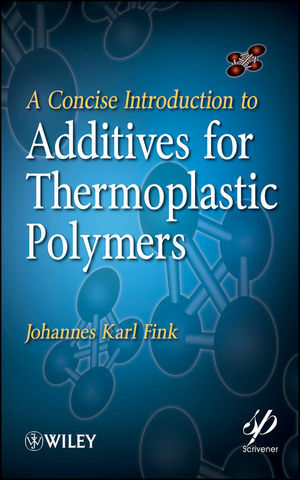 A Concise Introduction to Additives for Thermoplastic Polymers is the ideal primer for students who will later work in polymer science or the development of plastics formulation, as well as industry engineers and specialists who want to have a deeper knowledge of the plastics industry. JOHANNES KARL FINK is Professor of Macromolecular Chemistry at Montanuniversität, Loebem Austria. His career spans more than 30 years in the fields of polymers, including characterization, flame retardancy, and pyrolysis of polymers. 2.6 Specific Examples of Application. 4.1 Physics Behind a Color. 7.1 Mechanisms of Flame Retardants. 10.1 Basic Principles of Action. 12.3 Classes of Nucleating Agents. 18.1 Action of Metals in Polymers. 18.3 Examples of Metal Deactivators. 23 Prediction of Service Time. 23.2 Theory of Critical Distances. 23.4 Issues in Matrix Composites.